As a relatively new company, we know the importance of customer service, satisfaction and value for money. Crucial to your happiness, is a dedicated team of experienced and enthusiastic people. Wild Atlantic Cycling was founded by Paul Kennedy, a keen cyclist and active member of his local cycling club. Paul lives in the coastal town of Bangor, County Down, Northern Ireland. 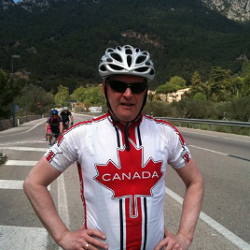 Paul has a wealth of experience organising day and multi-day cycling trips. Some of his Irish favourites include Cork and Kerry mountains, the Cooley Peninsula (County Down), Inishowen (County Donegal) and Northern Ireland's north coast. Matty is our resident mechanical expert! With his warm wit he’ll keep you laughing all week. A very accomplished cyclist, Matty is well known on the mountain and road bike racing circuits. Recent family commitments have given him an excuse to take his foot off the pedal a little. An Engineer at heart, Matty takes a very handson approach to tour support, and won’t stop until the job is done. 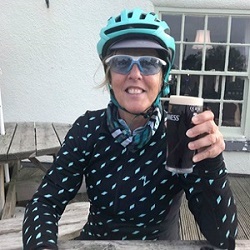 Alyson will be joining us in 2019 as Support Cyclist on one of our 7-Day Ireland tours. A keen fitness fanatic, Alyson spends hours on her bike, in the gym and on the tennis court. She is also a dedicated mother to three children and a midwife by profession. 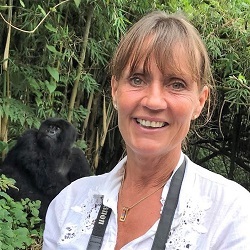 Alyson's positive nature and 'can do' approach will bring loads of energy and fun to our tours. Oh, and she's kind of competitive too! Biddi’s love of cycling started in rural France over 20 years ago amongst the sunflower fields of Bordeaux. Her ‘big’ cycles stretch from Kilimanjaro, through Tanzania and Rwanda, ending on the Congo border. She’s also recently biked in Ireland, from Mizen Head to Malin Head with Wild Atlantic Cycling. Her passion for photography makes her a great addition to the group. Biddi lives in Warwickshire with her three dogs and has four grown-up children. 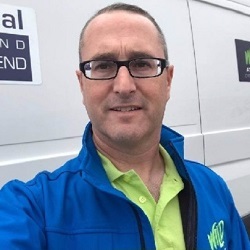 Brian is a retired high school athletic administrator from the Boston area and a cycling enthusiast. Upon retirement, he cycled the 4300 miles across the United States. In addition to cycling in the US he has cycled many countries in Europe including Italy, Slovenia, Spain as well as the mountain regions of the Pyrenees and Swiss Alps. 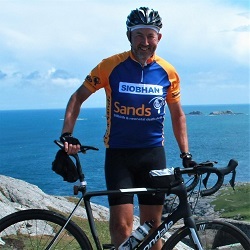 With extended family on the west coast of Ireland, Brian has cycled the country several times most recently doing the MizMal ride with his wife Julie in September 2018. He loves to share his passion of cycling with everyone. Stephen joined the team in 2018, cutting his teeth as Support Cyclist on our 2-Day North Coast tours. 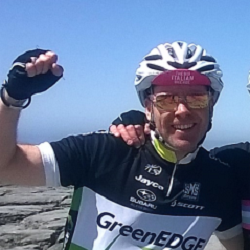 Stephen is an accomplished cyclist and regularly takes part in races and club runs. With a sharp wit and talkative nature, you'll never feel alone on the road when Stephen is around! An Accountant by trade, he also keeps us right with commercial and legal aspects of the company. Eric is a cycling veteran with a wealth of experience in both the racing and touring scenes. He has toured extensively on the west coast of Ireland and admits to it being one of his favourite regions for riding a bike. With extensive knowledge of the area, solid mechanical skills and a customer focused demeanour, Eric is a marvellous addition to the team. Eric lives with his wife in Bangor, N. Ireland, and enjoys extensive travel - in particular trips to visit his son and family in Canada. Kim aka Mimi is married with two grown up children and five grandchildren. She lives in Lincolnshire just outside Grimsby and close to the Lincolnshire Wolds, where she frequently cycles. A retired Nurse she has been cycling for six years starting with the Breeze Network (women’s only groups part of British Cycling). Kim completed Mizen to Malin with us in 2018, as well as The Way of the Roses & the Lakes & Dales Loop. Kim is super enthusiastic about cycling and competently helps with punctures and minor repairs. Stuart lives in Bangor, Co Down with his wife and two young children. Relatively new to cycling, Stuart has only been a member of North Down Cycling Club for 4 years now but has completed many sportives around Northern Ireland in that time. Stuart has also completed a Mizen to Malin trip himself, so has experience of the route and he also enjoys the evening entertainment along the way! Julie is married and has three grown children and two grandchildren. A cyclist since college, she has participated in cycling charities along with several state sponsored bicycle rides. She has cycled with her husband Brian in Europe and most recently the MizMal in Ireland. She enjoys being outdoors, hiking and cycling.